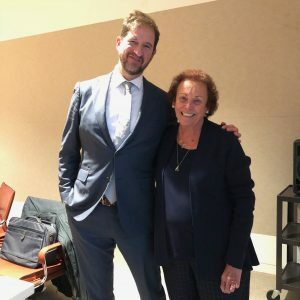 Convened by UT Dallas’s Edith O’Donnell Institute of Art History at the Dallas Museum of Art on November 12, 2018, the Conservation Science Colloquium sought to bridge the humanities and sciences by creating dialogues between the curators, conservators, and scientists in the Dallas-Fort Worth area and Texas more broadly. 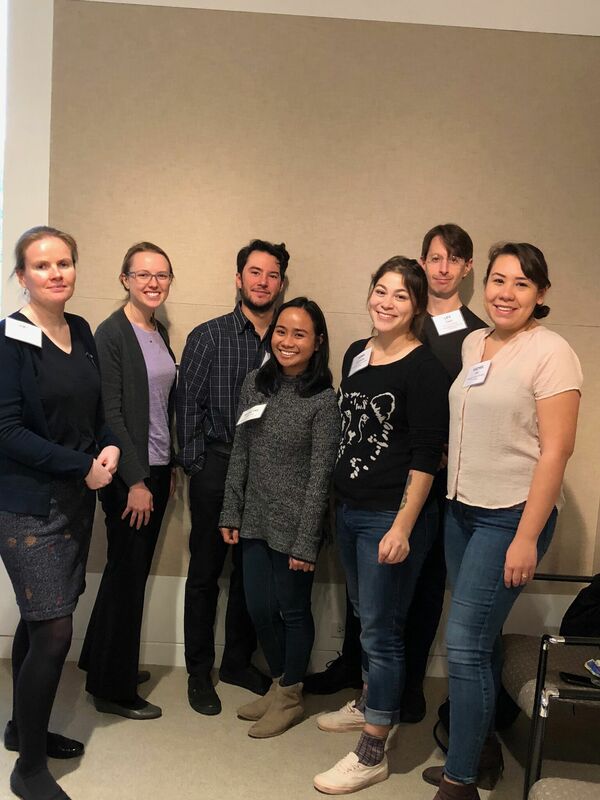 With a clear investment in cross-disciplinary research, the colloquium posited conservators as the synthesis of art history and science, linking those intellectual communities and arguing for the rich possibilities of their collaborative efforts. The keynote speech was presented by Dr. Robert van Langh, the head of the Department of Conservation and Science at the Rijksmuseum in Amsterdam and the chair of the Netherlands Institute of Conservation, Arts, and Science (NICAS). Dr. van Langh’s talk concerned a number of joint projects and research partnerships taking place in the Netherlands, emphasizing the importance of sharing resources. Foundational to his remarks was the value of a multidisciplinary approach to conservation, one which employs both an art historical concern for cultural heritage and the past lives of objects and a forward-looking investment in scientific innovation. This Janus-faced approach is crucial to the practice of conservation science. By observing change from the past and anticipating change in the future, conservation scientists act as caretakers of the objects that we hope to outlive us. In many ways, this entails envisioning the potential problems that conservation methods used today – many of which were developed in the 1960s – will have in the future, necessitating careful scientific research in order to mitigate any damage to the long-term stability of materials. The future of conservation science, therefore, is anticipating those changes: at its essence, conservation is at once eternally battling against the inevitable deterioration of objects and proactively staving off this material degradation. 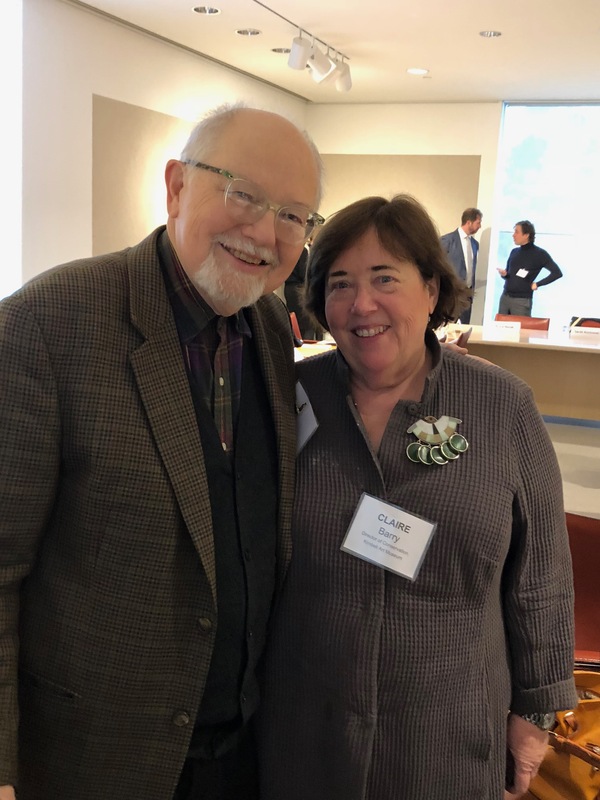 Notably, Dr. van Langh’s experience comes from a context in which government support drives and underwrites much of the research and provides the impetus for joint initiatives throughout the country. This level of state support is difficult to achieve here in the United States, making conservation science initiatives increasingly dependent on the kind of coordination and information-sharing between cultural institutions, labs, and universities that UT Dallas seeks to promote. Though Dr. van Langh discussed a number of specific research projects, his most resonant rallying call was for the open sharing of information and research. The Rijksmuseum and NICAS make their conservation research accessible online, and Dr. van Langh stressed that this generosity of intellectual capital was crucial to the overall success of the conservation community, benefitting the arts and sciences alike. Dr. van Langh’s keynote speech was followed by two presentations about ongoing projects within museum collections. 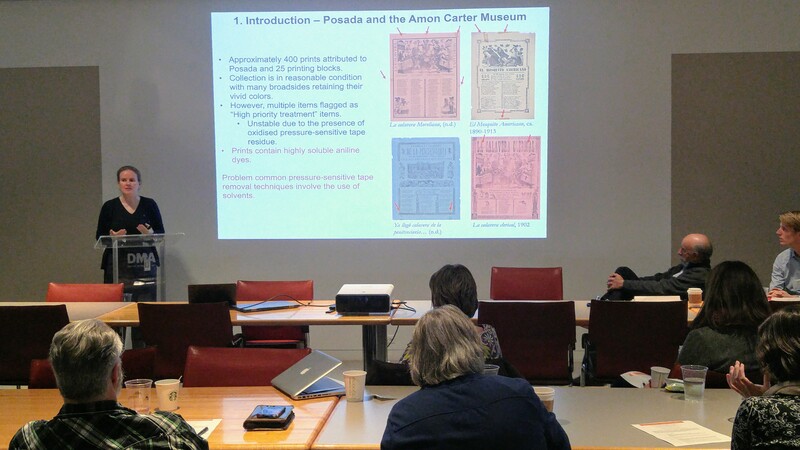 The first initiative was jointly presented by Jodie Utter, Senior Conservator of Works on Paper at the Amon Carter Museum of American Art, and Dr. Amy V. Walker, the Interim Head and Professor of Materials Science and Engineering at UT Dallas. Faced with the problem of removing adhesive residue from a series of early twentieth-century prints on colored paper by José Posada, Utter turned to Dr. Walker and her team in order to best determine the composition of the dyes and thereby prevent their dissolution or damage during treatment. Their approach utilized aspects of hard science and historical research, combining time-of-flight secondary ion mass spectrometry (TOF SIMS) in the labs at UT Dallas and consultation of historical catalogues by early dye manufacturers. The resulting data allowed Utter to successfully treat the prints and enabled the team to begin assembling a database of the chemical compositions of specific dyes in order to better facilitate future treatments. 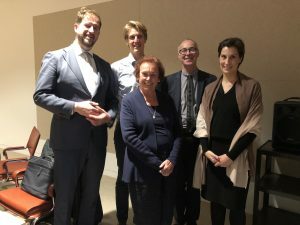 (L-R) Dr. Robert van Langh, Dr. Guus Verhaar, Bonnie Pitman, Dr. Norman Tennent, Dr. Sarah Kozlowski organize and present the Conservation Science Colloquium at the Dallas Museum of Art November 2018. Postdoctoral researcher Guus Verhaar then presented his research on glass degradation – also known as glass sickness – in museum collections, a project facilitated by joint support from UT Dallas, the Corning Glass Museum, and the Rijksmuseum. Verhaar’s research, which included the identification of degraded and at-risk glass objects in several museum collections, allowed him not only to work on practical treatments to remove or address damage, but also to collect data concerning the conditions that cause or accelerate these material issues. Salt build-ups and oxidization are great threats to the stability of glass, and Verhaar’s data suggests that practical adjustments to storage, such as the regulation of humidity levels known to encourage the growth of certain damaging chemical compounds, could help prevent glass degradation and allow conservators to treat affected objects in the early stages. These talks were then followed by a roundtable lunch, in which colleagues from the curatorial, conservation, and science fields were able to discuss the various projects and resources they were able to present to the larger community. During this session, Dr. Ignacio Pujana gave a presentation concerning the resources of the Micro Imaging Lab in the Department of Geosciences at UT Dallas. He encouraged the attendees to take advantage of the lab’s ability to produce clear, detailed images of natural materials at the microscopic level. The colloquium then ended on this note of possibility, with the hopes that this convocation of local conservators, curators, academics, and scientists is just the first step in an ongoing series of collaborations between the humanities and the sciences as Dallas-Fort Worth, and Texas at large, becomes a leader in the field of conservation science.